My solar story starts in the “dial-up” days of the internet when I stumbled upon something called Earthships. Intrigued by the idea of a completely self-contained home built from waste tires, I took off for Taos New Mexico to check them out. That year (maybe 1995), Taos hosted a Solar Music Festival and tours of Earthships in various stages of construction. I remember going into an unfinished building at night with no glass yet and feeling the radiant heat coming from the walls and floor of the passive solar building. I was hooked! Halfway through college for audio technology at that time, I decided to finish out the degree and keep solar as a hobby. My first solar module purchase was two Solarex 40 watt modules and a small Shurflo pump bought from the Real Goods catalog - the solar Bible at that time - to pressurize water for the 1890’s log cabin I lived in after college at Indiana University. I was living the off-grid homestead dream with a garden, solar, wood heat, an outhouse, two dogs and a national forest behind my 3 acres. It wasn’t until 2001 living in Portland, OR that I got bored with house cleaning and working the sound board in smoky bars every weekend that I decided to do something about this solar interest I had. On advice from my girlfriend (now my wife), I called up Andrew K. from Solar Solutions and asked if he needed any help. His reply, “We could use you if you were a Journeyman Electrician,” set me on a course to get my Journeyman electrician’s license. Four years later, after working as one of the only “liberal hippie” apprentices in a very conservative construction industry; I passed my test and started Abundant Solar. My first job was in 2005 as a one-person show with a few tools and very little actual solar experience outside of SolWest and MREA workshops. In 2006, Oregon revamped the Residential Energy Tax Credit (RETC) to allow $6,000 credit over 4 years, up from the previous $1,500 annual limit. Talk about being in the right place at the right time! For the last 11 years Abundant Solar has grown from a one-person shop to our current 6 employees and 2 straight vegetable oil powered trucks. My wife and I also built our current shop and our dream passive solar strawbale home in Corvallis. As the Oregon solar industry has boomed and busted (Business Energy Tax Credit ended.) I have come to realize how important our tax credits and incentives are to my business and the Oregon solar industry. 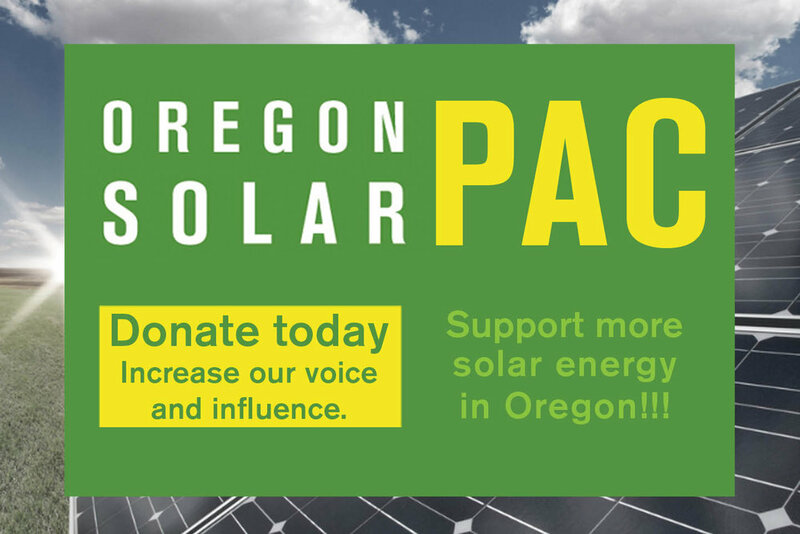 So along with my membership in OSEIA, I have decided to put my money where my future lies and support the Oregon SolarPAC with a monthly contribution. Just like I support Mercy Corps, OPB and lots of other organizations I wish to see continued growth, I am investing in stronger solar legislation and supporting those who are good at talking to lawmakers about my issues.